On January 3, 2018, a longshoreman was driving a forklift into a transit shed when he collided with a concrete support column and suffered fatal injuries after being thrown from the forklift. California OSHA’s investigation found that the employee was not wearing a seatbelt and that the forklift had multiple safety devices disabled, including a seatbelt warning buzzer and mast interlock system designed to disconnect power from the hydraulic lift when the operator is unseated. In another case, an employee of an Oregon lawn care company was attempting to attach a forklift to the back of a 40-foot flatbed truck. The worker unintentionally pushed the forklift’s joystick into the reverse position. The forklift jumped unexpectedly. The worker, who was not wearing his seatbelt, was thrown forward, his head hitting the upper part of the overhead guard. He was ejected from the forklift to the parking lot, where he landed on his head, suffering fatal injuries. Oregon OSHA’s investigation into the worker’s death found that his employer failed to enforce the forklift manufacturer’s requirement — and the employer’s own training policy — to wear the seatbelt and run the machine only from the operator’s seat. For many workers, seatbelt use is second nature. 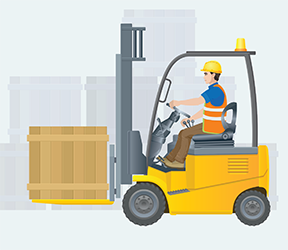 However, for others, the devices are seen as cumbersome, particularly when frequent stops are made, and also not needed ... after all, forklifts are heavy, stable equipment with a covered cab — what could possibly happen? But, as these two cases illustrate, operators can be thrown from forklifts and the resulting injuries can be fatal. That’s why many state OSHA rules have specific requirements that seat belts be worn in all powered industrial trucks. Federal OSHA’s enforcement policy also requires employers to ensure restraints are worn, though there is no specific requirement. If you have forklift operators in your workplace, share stories such as these to drive home the point that one instance of not wearing a seatbelt might be one too many. The Safety Training Talks manual makes it easy to deliver essential safety training by providing you with nearly 300 ready-to-use talks covering a wide variety of general industry (Part 1910) and construction (Part 1926) regulations.